Last fall, Lindsay Johnston bought a rig large enough to tour with, quit her job as a bartender, and set out to make a go of being a full-time musician. She knew it wouldn't be easy, and she'll tell you the rock-star lifestyle is far from the glitz and glory most imagine. "There was one night that we were at the bar that we were playing at, and most of the time they'll give you a food tab, but they didn't for that night," Johnston says. "So I'm like, 'Can I get some hot water?' and I'm eating instant oatmeal, sitting at the bar, and eating frozen vegetables. It's not glamorous, but I'm learning that I can be OK with next to nothing." Without a steady paycheck to ensure things like rent payments, she's been couch surfing with family and friends in Spokane and the Tri-Cities, and she frequently stays at her partner's place. She's travelled to shows all over Washington, as well as several spots in Oregon and some in California. Not every place even comes with the certainty that she as a solo artist — Vanna Oh! — or her band — Vanna Oh & the Any's (called that because she'll play with anybody) — will get paid by the venue. On top of the normal challenges of starting out as a touring artist, she's trying to make it as a female vocalist and lead guitarist, something she's been reminded is still unique in some corners of the music world. Take the time Johnston put on a show in Portland with her previous rock duo, Donna Donna, and a dude who was digging the show shouted up at them. "The guy was like, 'Pretty good! For girls!'" Johnston says. Sure, she could just get pissed off, but Johnston says she also recognizes there's some truth in the idea that there aren't as many "women who are really digging into the electric guitar." In fact, part of what inspired Johnston to pick up electric guitar when she was 25 was seeing a lack of role models. Now 30, she feels she still has plenty of room for improvement, but she also wants to see the music world get to the point where that man's comment is irrelevant. "There's something built into our culture that makes us think, 'Wow, yeah, we're never gonna be as good.' Or, 'This isn't for women, this isn't for people that look like me,'" Johnston says. "But the part of his comment that's like, 'Pretty good for girls,' that's the challenge. Let's make that not true." 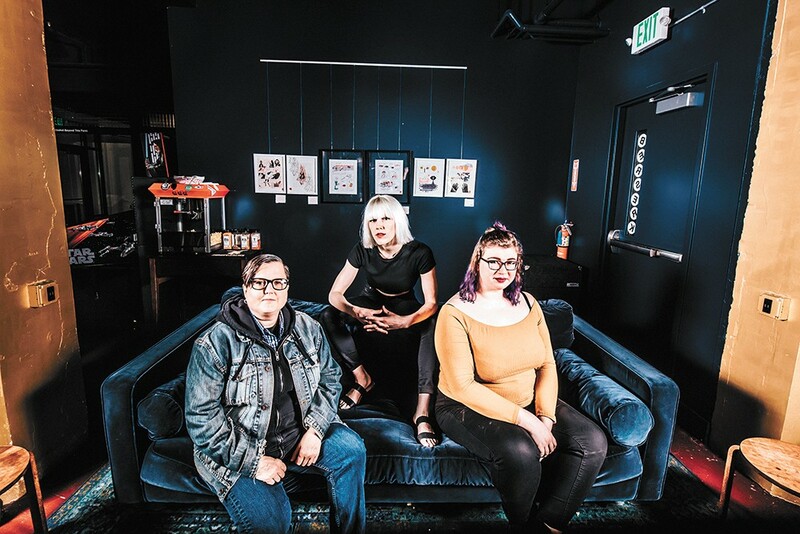 Overall, Johnston and other women in Spokane's music scene say sexism hasn't been an issue in what's been a fairly open, accepting community for decades. Cameron Smith is a social worker by day, and a drummer with local bands Silver Treason and Fun Ladies by night. She's been involved in Spokane's music scene since she started playing in a punk band in high school in the mid-'80s and says it's always been inclusive. "I didn't feel like there were any barriers to women being involved in the scene," Smith says. "It always felt very respectful of women to me. The musicians in particular." She's partly troubled by the idea of talking about "women in music" or "women in rock" because it kind of places those musicians in a subcategory of sorts. "And I don't think it should be a subcategory, because no one ever talks about men in the scene in the same context," Smith says. "I think women should be graded on their own merits as musicians the same way that men are. It should just be standard." Still, she's not gonna pretend that over the years she's never heard comments like "you're good for a girl" or received what came across as backhanded compliments, no matter the person's actual intent. "I'll admit, I may have developed a style of hitting harder to compensate for that," Smith says. "I definitely wanted to hold my own with whomever." Over the years, she has. The list of bands she's been in is massive, including, but not limited to: Neurotic Jesuits (high school), Big Feeling (circa 1990), Frenchie (kind of a supergroup in the indie-punk scene), and after taking a break after having a baby, she came back to join the Cruddlers, then Quitters Inc., then Burns Like Hellfire, which lasted several years, and now she's in her current bands. The openness in Spokane has enabled musicians like 23-year-old Ashley Pyle, who would describe herself as shy, to not just find a place playing at open mics, but to make connections that opened doors to recording opportunities. "I've never been the going-out type. ... I wasn't the concert-goer," Pyle says. "But now I walk into the Riddler on open mic nights and I have to just plan into my night that I will make a round of going and saying 'Hi' to everybody." Like Johnston and Smith, Pyle says she's felt nothing but welcomed into Spokane's scene. Through the friends she made at the Red Room, Soulful Soups and more, Pyle met Jeff and Doug Bell of Hammock Cave Studios, who offered to record her music. Pyle recently dropped her first CD, the AP EP, and after having some bad experiences with other people who'd offered to record her stuff, she says she couldn't be happier. "I had tried to record a couple of other times with other people and just got completely screwed over," Pyle says. "And then Doug was like, 'I want to record this song for free.' So I'm like, 'OK...' But then we did, and he put together a rough version and it was fantastic!" Each of them say their best advice to anyone looking to get involved is to get out to shows, start making connections, and don't be afraid to just try things out. The original print version of this article was headlined "Pretty Good - for a Girl"